Absolutely! Lets say for example, you’re a sales agent and need to segment your prospects and clients based on what they’re looking for and how far along they are in the buying process. The animation below illustrates how it works. 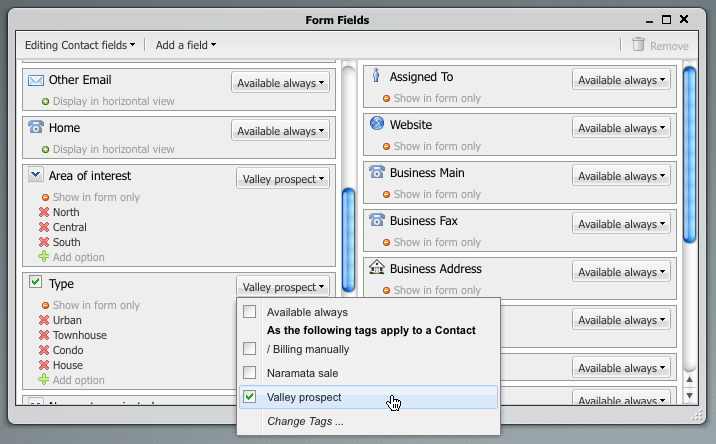 We’ll add the tag “Valley prospect” to apply fields specific to capture which area/project/unit they’re interested in, then as you make a sale add the tag “Naramata sale” to apply the extra fields necessary to record the details of the contract. In another example let’s assume that you bill clients using an online service, but there are a few exceptions that call for a personal touch. 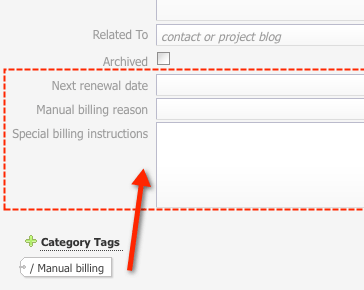 Simply add the tag “/ Manual Billing” and the set of fields related to that process instantly appear on the relevant contact’s form. Contextual fields require no programming. As the Solve administrator simply drop your custom fields on Solve’s built-in form designer and choose when they should be visible. From that point on your staff simply select a category tag and the contextual fields are added to the page instantly. With contextual fields the door is wide-open for how your team can manage countless real-world situations such as different types of prospects, clients, subscribers, service providers, attendees, donors, investors, applicants, cases, locations, special event tracking, and of course the multitude of cases for projects. With Solve you now have a flexible database system that can simply and seamlessly handle a multitude of cases.